For those born March 17, 1967. You're one of the first people who's never lived in a world without Star Trek. In November 2015, David Sims wrote about the return of Star Trek to television. Around the time you were born, the first French nuclear submarine, Redoutable, was launched. On October 8, 2014, Robinson Meyer recounted the story of testing the first nuclear submarine's reactor. You were born in March of 1967. This year, The Atlantic celebrates its 160th birthday, making it 3 times as old as you. The year you were born, Mark Harris wrote about the hippie culture that flourished on San Francisco's famous Haight Street. Fame was released in 1980. 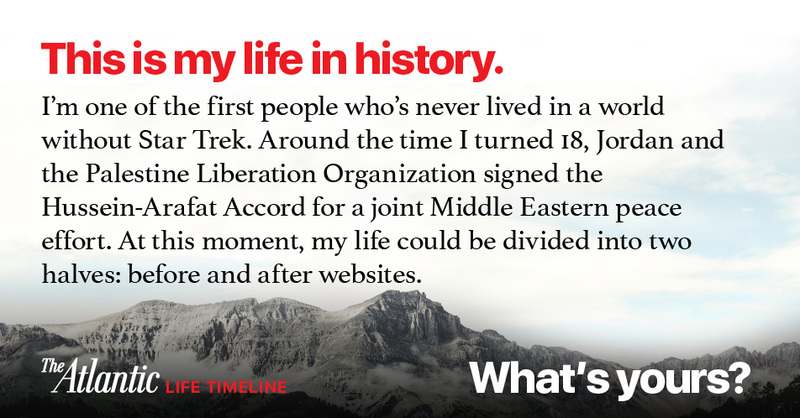 Around your 18th birthday, Jordan and the Palestine Liberation Organization signed the Hussein-Arafat Accord for a joint Middle Eastern peace effort. In September 2005, David Samuels argued that accord signatory Yasir Arafat destroyed Palestine. At 22 years old, you saw the collapse of the Berlin Wall. Your life can be divided into two halves: before and after websites. In February 2015, Julie Beck wrote about what is lost when websites change or disappear. In 2006, Connie Britton, who was born the same year as you, began starring in the TV series Friday Night Lights, for which she was nominated for two Emmy Awards. In July 2010, Tony Lee wrote about the strong marriage depicted by Britton and Kyle Chandler in Friday Night Lights. When you turned 43, you saw the rise of the Arab Spring. By the time you turn 64, the collective GDP of the four leading developing countries (Brazil, Russia, India, and China) is likely to match that of today's leading Western nations.